Renowned Vietnamese-American artist Tiffany Chung shares her methodology of excavating buried personal stories and collective memories, how she processes her findings both internally and as an artistic output, and current engagements that lead to the further expansion of her practice. Chung's persistence in uncovering hidden (hi)stories and examining geopolitical shifts throughout history has coaxed then-policymakers and refugee lawyers to resurface, offering an impetus for current policymakers and the society at large to reflect on and confront the ongoing refugee crises, one of today's largest socio-political issues. Tiffany Chung has received worldwide recognition for her exquisite cartographic drawings and installations that examine conflict, migration, and displacement amidst urban progress and geopolitical shifts. Through her cartographic works, videos, installations, and performances, Chung continues to push the boundary of her artistic practice as well as the borders of what people think "art" is and can do. Chung holds an MFA from University of California, Santa Barbara (2000) and a BFA from California State University, Long Beach (1998). A co-founder of Sàn Art, an independent, artist-initiated space in Ho Chi Minh City, Chung is committed to furthering the development of contemporary art and artists in Vietnam. She currently lives and works in Ho Chi Minh City, Vietnam. Meiko Sano (hereinafter Sano): Thank you for joining me today, Tiffany. Let's jump right into it. 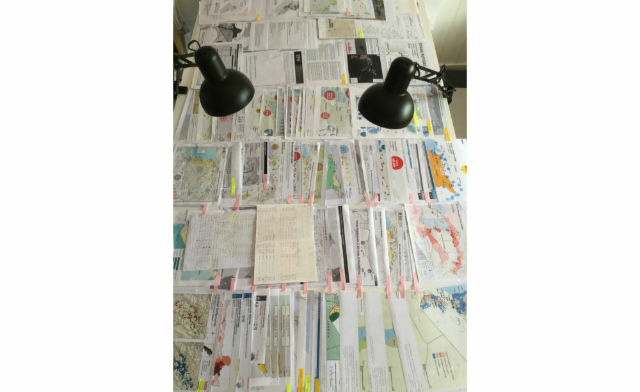 Much has already been said about your cartographic works so, while going over some of them, I'd like to know more on your methodologies, and how you work between different mediums and outlets. But first of all, let me ask you: you're referred to a lot as being a researcher, a historian, an archaeologist, and sometimes an anthropologist. What do you identify yourself as the most? Tiffany Chung (hereinafter Chung) : I am an artist, first and foremost. Recently, I have become a little more confident about my role as a researcher, regardless of my having formal training or not. But my methodology and interdisciplinary approach do make my research more in line with ethnographic and anthropological fieldwork. Sano: Because you actually go out and speak to people in person, don't you? Chung : Well, you become part of a community. I don't go there with just a list of questions because that's not how one should do it. Of course, I read a substantial amount of texts on the socio-historical issues I am dealing with, but I also want "real" stories—the stories of those who were directly affected. For instance, with The Vietnam Exodus project, I joined Facebook or online forums of each of the former Vietnamese refugee camps; many of the refugees who went through these camps would be there, online. And I would go in and be part of those groups. Sano: Did you identify yourself as an artist or use a pseudonym? Chung : I tell them my name, but I'm basically there just talking to them online. I don't ask direct questions, I stalk them [laughs]. There were so many comments: one person would post photos of a camp, another would come in and comment, "Oh, I remember that; I was there." Then another would join in saying, "I was there between '80 and '82" and so on. That's how I stalk them; listen and chat with them. So then I hired a research assistant, and extracted all of these stories and compiled them onto huge spreadsheets—one spreadsheet for each camp with each of their names, if we could identify it, and stories. And for each name we had columns for the year they left Vietnam, the boat number, the year they arrived or got rescued in the East Sea—or South China Sea—, the dates they stayed in a camp, whether they were able to resettle, if so in which country, and in what year. Sano: I think that's one of the fascinating elements of your work: how you delicately fuse these two very different types of data—the hard and the soft. Chung : Well, you have statistical data and the policies, but you also need the refugees' experiences to make the story complete. I want a comprehensive understanding of the history, not just a one-sided one. My objective, ultimately, is to counterbalance official accounts. I've spent a lot of time with the former refugees in Hong Kong; I'd just ride the bus with them and listen to the same stories repeatedly to the point that I could memorize them. It's become a reflex. Sano: How did they tell you their stories? Because their trajectories must be very complicated, I assume. Chung : They are. When I worked with the Vietnamese community in Hong Kong—I followed them around for about two years—one man finally came up and said, "My journeys were very interesting, you should record them." And we sat down with his laptop, and he showed me his escape routes using Google Maps and satellite maps. Some of them still think I do this research for the UNHCR [United Nations High Commissioner for Refugees]. The gentleman who showed me his escape routes first asked me if the UNHCR had decided to look into stateless cases like his. He lives in Hong Kong, but he is not a citizen, you see. He has a travel document but he is still stateless because he was undocumented to begin with. Here is another interesting story: I was chatting away with people on the online forum of the Vietnamese refugee camp in Singapore. This woman and her family were saved by a merchant vessel and brought to Singapore. She then gave birth to her son just a day after disembarking, so she named him after the vessel, and I helped her locate the vessel. Sano: You located the actual vessel? Chung : Yes, the exact one. I found some photographs and showed them to her. She said it may be the one and showed it to her husband, and he replied saying, "This is it!" I told them about the history of the vessel and what happened to it in the end. But then, there was a list of people asking me to locate their vessels too [laughs]! So I helped four more cases and after that had to disappear from that forum for a while. Sano: Had she become stateless too, like the gentleman in Hong Kong? What was her situation once she arrived in Singapore? Chung : Well, Singapore was an interesting case. Although there was some rule-bending here and there, its policy was to only accept refugees whom the merchant ships rescued and were able to find resettlement offers for. Singapore would host them over a course of three months while waiting for their resettlement, and that's why the vessels are particularly embedded in the refugee's memories. Sano: So you become a part of the community to listen to the stories. But how did you accumulate all the statistical data? Chung : Well, like I said, you need both sides of the story, and with The Vietnam Exodus project I realized there were still many missing links. So the next step was for me to go to the UNHCR—UN Refugee Agency in Geneva to dig into their archives. The thing is, they have indexed the old records by countries and years, but they haven't digitized anything. So they are still the actual documents that I could touch; the papers were worn out and some almost torn. It really was an amazing experience. Sano: It must be a lot of work even just to navigate yourself through the indexes. Chung : That is true. You also have to know all the boxes' ID numbers of the files you're looking for. You have to be familiar with the historical background of what you're dealing with and be able to approximate—between this year and that year, there was this incident during a migration peak, so maybe there were certain policies at play here, et cetera. Sano: How long would you spend at the UNHCR in one visit? Chung : Usually, I would spend one week in there. I'm a calm person when I work. I am not interested in hysteria and I think my work has that quality to it. But to sit there and go through all of these old corresponding cables, looking for something can get quite exhausting. Sano: Especially because you're looking for something you don't know is even there. Chung : Exactly. I think the problem with some academics is that they go knowing what they're looking for just to substantiate their theories. I'm not interested in that. I'm there to discover the hidden histories that other people might not know about or have missed, and I'm open to every bit of information that I come across. JFAC will invite about 60 professionals engaging in creation of contemporary performing arts.